A TIE CLIP (also tie slide, TIE BAR, or tie clasp) is a clothing accessory that is used to clip a tie to the underlying shirt front, preventing it from swinging and ensuring that the tie hangs straightly, resulting in a neat, uniform appearance. Tie clips are commonly made of metal and often have decorative patterns or embellishments. Some clips have a small badge indicating membership to a club or some other affiliation, or some other commemorative token, in a similar manner to the way in which ties themselves may be used as signs of membership. The use of tie clips gained prominence during the 1920s, during which period the use of straight ties made of delicate materials such as silk became more fashionable, and they largely came to replace the more traditional tie pin. 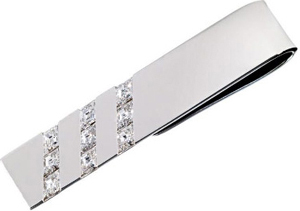 In the United States, a tie clip is one of the few items of jewelry allowed to be worn by servicemen and women. A TIE PIN (or tiepin, also known as a stick pin/stickpin) is a neckwear-controlling device, originally worn by wealthy English gentlemen to secure the folds of their cravats. Gold or silver safety pins were commonly used as tie and collar pins from the beginning of the 20th century (Woolworths used to stock cheaper bar type pins). A tie pin was used to fasten the tie to the shirt and was an integral part of a man / boy's uniform or clothing. In the 21st Century, other devices are now available to secure an unruly tie though a safety pin may be used as an unobtrusive 'underpin' to achieve the same degree of neatness. How to Wear Your Tie Clip - Real Men Real Style. Tie Clip & Bar Primer - Gentleman's Gazette. Allen Edmonds - "An American Original." American flag lapel pin. Andrew's Milano - lapel pins & tie bars. BENSON & CLEGG - founded in 1937. 9 Piccadilly Arcade, London, U.K. Lapel pins. BENSON & CLEGG - founded in 1937. 9 Piccadilly Arcade, London, U.K. Tie tacks & slides. BOTTEGA VENETA - tie clips. 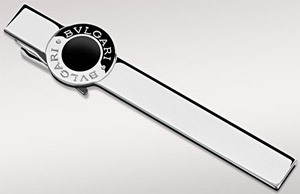 BVLGARI - since 1884. Tie bars & clips. BURBERRY - since 1856. Tie bars & clips. Caran d'Ache - tie bars. CHARLES TYRWHITT - since 1986. Jermyn Street, London. Silver plated tie clip. Charvet - founded in 1838. Flower Lapel Pins. Deakin & Francis - since 1786. Tie slides. DUNHILL - since 1893. Tie clips, bars & lapel pins. EDWARD ARMAH - Boutonnières / Lapel Flowers. FREYWILLE - since 1951. "Pure Art." Tie clips. GEOFFREY BEENE - tie clip. GIEVES & HAWKES - since 1771. "No.1 Savile Row London." Tie bars. Hackett London - tie clip. HARRY WINSTON - Three Row Tie Bar. J.PRESS - tie bars & clips. JACK Spade - tie clip. 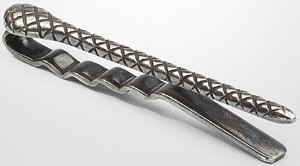 Joseph Abboud - tie bars. Kamakura Shirts - since 1993. Tie clips. KENNETH COLE - tie clips. LANVIN - tie bars & clips. Le Noeud Papillon - Hand Made Silk Flower Lapel Buttons. Louis Vuitton - tie clips. OwnOnly - tie bars & clips. PAUL SMITH - tie clips. Paul Stuart - tie bars & clips. Philip Kydd - tie clips. RALPH LAUREN - tie bar. TED BAKER - tie bars & lapels. The Custom Shop Clothiers - since 1937. Tie bars. Theo Fennell - tie slide. THOM BROWNE - tie bars. T.M.LEWIN - established 1898. Jermyn Street, London, U.K. Lapel pins. TYLER & TYLER - tie pins. VIVIENNE WESTWOOD - tie clips & pins.